Sunday morning, a tiny scrap of paper on the floor. A very square scrap of paper. I bend to pick it up and find that it’s not a piece of paper at all. It’s a little white sticker, with three black circles – spheres – on it. A bear? 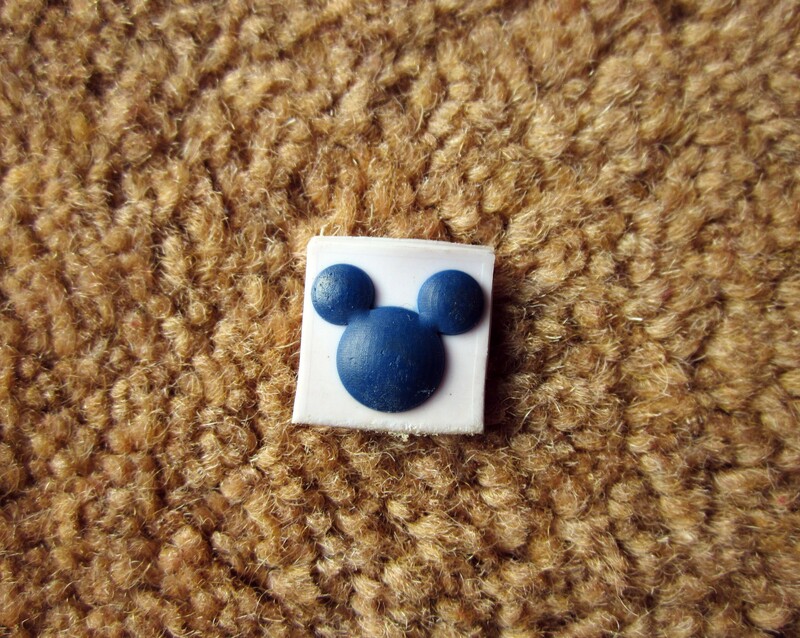 I thought it was Mickey Mouse. We both stare at it, soppy smiles on our faces. She was lovely, wasn’t she? Megan. Two in August, breaking hearts already. Megan’s mum and dad had come to view our house. We’re selling it. They have a good look round. They like the house. But the little charmer in the blue and white gingham skirt does something else, something quite amazing. Her little feet patter across the timbered floor in the hall, scamper around the sitting room. She spies Piglit and Pooh’s pencil box the instant she walks in the study and as for the exercise ball in the junk room – it has her gurgling with delight. Out in the garden the sun beams on us all and Megan romps onto the lawn, falls down, gets up, falls down with ne’er a wail or whimper. The step’s good for jumping games – she takes my proffered fingers in her tiny hand as she jumps down, then crawls back up and jumps down, again and again and again. A little girl – or boy – belongs here. In a leafy garden on a sunny day. We’ve grown a lovely garden, created a house we like. It took us years. A not-quite-two-year-old girl made it a home, in seconds. This entry was posted in Thinking, or ranting, or both and tagged garden, Home, house. Bookmark the permalink. Short and very sweet. It started my day with a smile. Thanks Lou! Ah – you’re welcome hon! Children have a way of doing that, don’t they? If they like a place and feel comfortable there they just seem to own it straight away! Kids like cats and dogs pick up the energy of a place and have an instinct of what is to be. Megan made herself quite at home, and bestowed a little treasure of her own. Perhaps so she has something to come back for. It’s wonderful to think that it’s meant to be, and handing a wonderful legacy on is so very different to leaving something behind. You are so right and it’s so well put – leaving something behind it is not – I like the idea of it being a passing-on of something cherishable to those who will cherish it. It’s not going to be Megan and her mum and dad after all – but another tiny creature – a boy – and his lovely young parents. I’m really pleased and hope it all goes well – such a fraught process. Thanks again for reading.